Whether you're frozen and covered in snow (hi New York friends!) or getting ready for a week of fog and rain (hi Portland friends!) or somewhere in between and need a break from gray skies and winter temperatures - here's a wallpaper download for you! Set it and pretend you're somewhere bright and dry. Enjoy! I've really fallen off my monthly playlists! Moving across the country has consumed most of my focus and time. Now that I've been in Portland (nearly) 3 months things are settling down and I'm settling in. I put together some of the songs I've been enjoying this season. I've been so inspired by the beautiful colors and landscapes of the Pacific Northwest, especially as we've drifted towards fall. My new apartment has a view of the West Hills of Portland and I love seeing morning mist and fog drift over the blend of evergreen, yellow, and orange. I think these songs are perfect for that mood - enjoy! I'm always interested to see how illustrators approach sketches for their assignments. We of course see the final artwork in print or online, but I also love seeing the initial concepts and evolution of imagery that got there. Recently, Intercom shared a post about this, including initial sketches alongside the final illustrations. I've worked with them in the past and I'm a big fan of what they've been doing with their blog and artwork recently. It's cool to peek into the process in this way. I wanted to share a few of my projects with them, including the original sketch and the final piece. My sketches are fairly tight which means the final illustration is very close to the original concept. That's especially helpful for complex images, like the stairs with cacti. Sometimes I'll adjust elements as I go if something isn't working overall, but otherwise once the sketch is approved, I'm good to go straight to ink and color! Illustrators, is your sketching process similar? More loose? More detailed? I'd love to hear how everyone approaches this and works best. After what felt like ages of dreary and cold weather, this week has been sunny and warm. Everyone is out in full force, enjoying the arrival of spring (and hoping it lasts!). Here's my latest playlist for April. Listen and enjoy! Artists such as Sara Jensen, Adam J. Kurtz, and Natalie Shahmiri contributed and all of the postcards are fantastic. You can download, print, and use them to contact your legislators! See here! I've also adapted the artwork into a desktop and iPhone wallpaper. You can download using the links below. Feel free to use and share. Enjoy! I recently worked with Curbed New York to illustrate the feature "50 Small Ways to Make NYC a Better Place" (link here!) This is an awesome concept and list to have at any time, but even it feels even more necessary at the moment. Enjoy the illustrations and the amazing list of things you can do! Any other thoughts on how we can improve our communities together? The weather has been so pleasant in Brooklyn over the last week or so. In the grand scheme of things this is rather unsettling as it means the only planet on which we can live is slowly starting to sizzle with all of us on it BUT in a more blissfully ignorant way, it feels nice to walk around without a jacket. I've created a new wallpaper background for your computer and phone inspired by the warmer temperatures. Download for desktop and iPhone now. I hope you enjoy! How's the weather where you are? My February playlist is here! January always feels like the longest, most unrelenting chunk of winter. Once it's finally over and February arrives, I start to feel a bit more hopeful for spring! These are the songs I've been enjoying now that the sun is breaking through the blanket of gray clouds and the temperatures are rising, ever so slightly. I will say that the playlist artwork felt a bit more appropriate yesterday, when it was 62 degrees in Brooklyn, versus now while in the middle of a snow storm! At any rate, I hope you enjoy it. Let me know what albums you're listening to at the moment, too! December has arrived! The leaves have fallen along with the temperature here in Brooklyn. Plenty of holiday parties and travel plans are upon us and soon 2017 will be as well! Before then, I wanted to share a holiday themed wallpaper I created for both desktop and iPhone. One of my favorite aspects of the holidays are all of the good smells that come along, too. 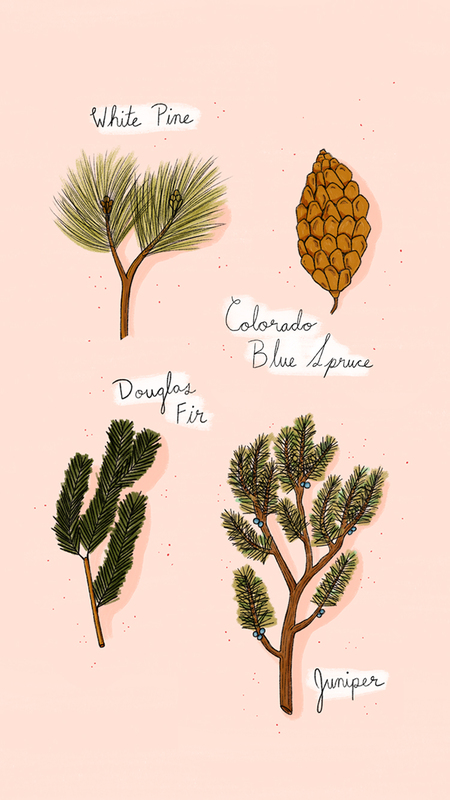 I've illustrated a few of my favorite holiday related shrubs and trees that also smell awesome! Plus it's a little break from the typical red and green color scheme that takes over this time of year. Hopefully it will bring some cheer your way! You can download it for desktop and iPhone now. Enjoy and Happy December! The November playlist is here! Enjoy it at home or during your Thanksgiving travels. I hope everyone has a lovely, restful holiday full of good food and good times. I've put together a playlist of some of the songs I've been listening to during the month of October. It's always fun to share music and it gives me a good excuse to create a piece of artwork as the cover! I hope you enjoy it - let me know what your favorite songs are! Earlier this spring I began working with Curbed on a new project they launched in collaboration with State Farm - The Curbed Home Handbook. The Home Handbook is an ongoing, online resource for everything home and garden related (apartments too!). Creating the illustrations for the different chapters and stories has been a really fun process and I wanted to share some of my favorites! New chapters will be added over the next 6 months so stay tuned for more artwork! Last year I had the chance to work on several editorial illustration projects, all of which I really enjoyed. When I sat down to think about my goals for 2016, "more editorial work" was high up on the list. 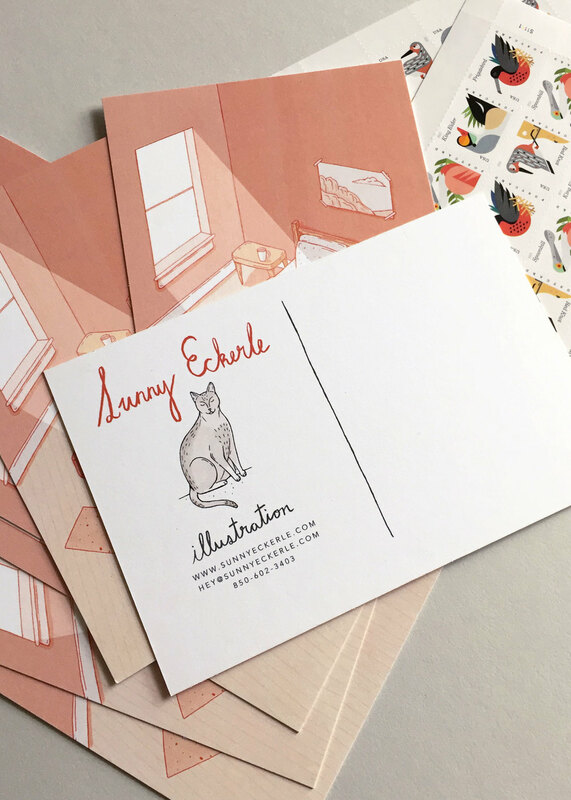 To help that along, I've recently sent out a round of postcards to art directors near and far. I'm hoping they enjoyed receiving a warm & cozy image during the cold days of winter! 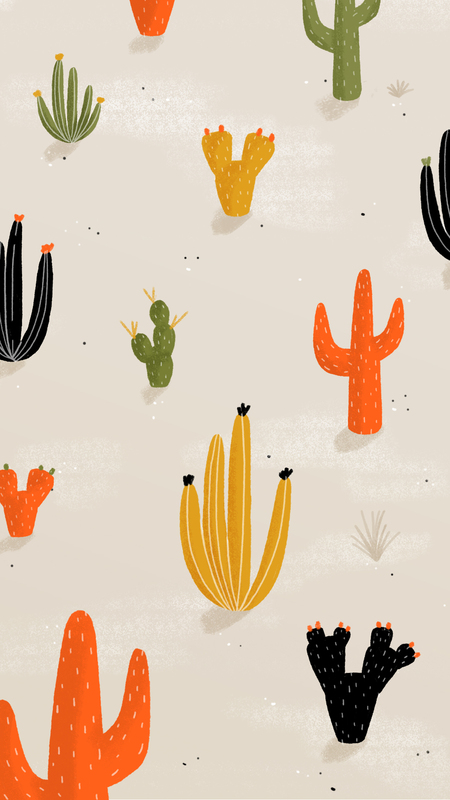 If you or anyone you know has illustration needs, I'd love to chat! You can message me through my "contact" page or shoot an email to hey@sunnyeckerle.com. Working for yourself often means working by yourself. While this doesn't get me down (I tend to prefer it, lucky for me! ), it does mean there is a lot of silence to fill and time to pass during the days and nights. When I'm not listening to WNYC or whatever podcast I most recently came across, I have to have some good tunes handy. With that in mind, these were my top albums of 2015 - the ones that got me through long nights working late or slow afternoons when I needed some extra motivation to stay at my desk. These are in no particular order aside from how I felt like drawing them. I hope you enjoy and Happy New Year! If you can't always be petting cats, at least you can always be looking at them! Download my cat pattern wallpaper for your desktop or iPhone. Enjoy! Today I went looking for some new bodega cats but sadly, I came up empty. Since I don't have any new cats on my list, I've drawn the new beverages I've found instead. Most the bodega cats I've drawn up until this point have been ones that I met organically. I've popped into a store for a coffee or water or gum and seen a cat on the counter or hiding under a rack of chips. It's super exciting when this happens, (1) because I love cats and (2) it means I have another subject to draw. But sometimes I'll also go on mini-pilgrimages (like I did today) to look for new cats . Which means I need a bit of cash and a lot of luck. In 80% of the stores I go into, I don't find a cat. It's tough to determine whether they truly don't have one or whether it may be napping or hiding. Asking works sometimes, but store owners can be weary of (or irritated by) me coming into their store and immediately asking about cats. It's my "policy" to always buy something in each store I go into when I look for cats. It gives me a chance to scope the place out but it also means I'm not being (totally) annoying by coming into a shop, lurking around, and leaving empty handed. Today was a bust in terms of cats but at least I got a fridge full of drinks out of it. Not much can be said about the internet that hasn't be said before, but I'll go ahead and add one more bit of commentary. I really like it. While it can sometimes feel like a strange periscope that shows only people who are more happy, popular, successful or talented than you, it's more often than not an incredibly powerful and surprising vehicle to meet, connect, and collaborate with people that you'd otherwise not have the chance to know. Most recently, it brought me together with Muriel Vega, an Atlanta based writer and developer. I don't remember when or how Muriel and I started following each other on Instagram. Never having met in real life and living over 800 miles away from each other, it's one of the fun coincidences made possible by social media. Through whatever digital happenstance connected us, I was able to watch her progress on something she dubbed Muriel's 50 Pies. Earlier this year she set a goal to bake 50 pies. She wasn't much of a pie baker before she started her quest (although she would come to be one, just check out her Instagram!) but rather she wanted to challenge herself to learn something new, get better at it, and have patience throughout the process. It was a very cool and inspiring project, which you can read more about here. A few months ago, Muriel reached out to me about the next iteration of the project, which was a zine that would combine the recipes, memories, and emotions about pie that people had begun to spontaneously reach out to her with. See? This is why I really like the internet. She was pulling everything together and asked if I'd like to illustrate the cover for the zine, which I gladly accepted. I just received my copy of the zine over the weekend and it's truly such a lovely piece. The limited edition of 50 (which are now sold out) were available online and in select shops around Atlanta. Even better, Muriel donated the proceeds to the Atlanta Community Food Bank! I was so happy to be part of the project and to have the opportunity to work with someone as kind and driven as Muriel. It's so inspiring to see what people can accomplish when they set their minds and hearts to it. It's also so exciting what people can do together when they're able to connect over common goals and interests. A fews shot of the PIE zine goodness from Muriel's Instagram. For sale in Criminal Records in Atlanta!